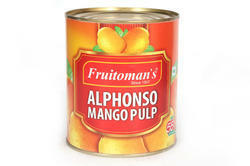 Pioneers in the industry, we offer mango pulp from India. Keeping in mind the diverse requirements and needs of our prestigious clients, we are instrumental in providing quality assured range of Mango Pulp. The provided pulp is processed by the use of natural ingredients that are sourced from the authentic and certified vendors of the market. Moreover, we also assure that these pulps are formulated in adherence with set food industry norms. We offer the entire range of these pulps at affordable prices.